The red wolf (Canis rufus) is one of the world’s most endangered wild canids. Once common throughout the southeastern United States, red wolf populations were decimated by the 1960s due to intensive predator control programs and loss of habitat. A remnant population of red wolves was found along the Gulf coast of Texas and Louisiana. After being declared an endangered species in 1973, efforts were initiated to locate and capture as many wild red wolves as possible. Of the 17 remaining wolves captured by biologists, 14 became the founders of a successful captive breeding program. Consequently, the United States Fish and Wildlife Service (USFWS) declared red wolves extinct in the wild in 1980. By 1987, enough red wolves were bred in captivity to begin a restoration program to return the species to a portion of their traditional range in the southeast United States. For over two decades the USFWS has been restoring red wolves to the Alligator River National Wildlife Refuge in northeastern North Carolina. And in 2004, the WCC joined the recovery effort via its acceptance into the Red Wolf Species Survival Plan and has played a critical role in preserving and protecting these imperiled species through carefully managed breeding and reintroduction. 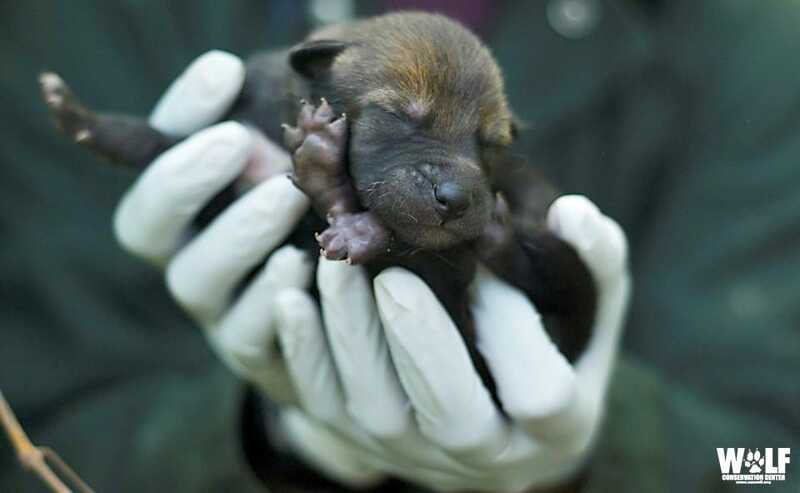 To date, the WCC has welcomed two red wolf litters (2010 and 2014) and a single red wolf from the WCC has been given the extraordinary opportunity to resume his rightful place on the wild landscape. As of the start of 2019, the WCC is home to 20 red wolves. 14 of our resident red wolves occupy enclosures in the WCC's Endangered Species Facility. These enclosures are private and secluded, and the wolves are not on exhibit for the public.The WCC’s six other red wolves reside on exhibit in the Red Wolf Exhibit which opened in October of 2009. For the first time ever visitors to the WCC are given the opportunity to see this rare and elusive species. In September 2014, the USFWS announced that it would be conducting a review of the red wolf recovery program in eastern North Carolina, per request of the North Carolina Wildlife Resources Commission (NCWRC), to determine if USFWS should continue, modify, or terminate the program that manages the last remaining wild red wolves on our planet. While USFWS continues to review the program, it has halted all captive-to-wild releases. Also remaining on hold is a key management activity—the release of sterilized coyotes to prevent hybridization. Red wolves remain among the world’s most endangered species. Re-implement the Red Wolf Adaptive Management Plan (RWAMP) to manage a small group of wolves on ARNWR and Dare County Bombing Range as a propagation site for future reintroductions. The current estimate puts the only wild population of red wolves at their lowest level since the late 1990s. Only 24 red wolves are known to remain in the wild. The red wolf is one of two species of wolves in North America, the other being the gray wolf, Canis lupus. As their name suggests, red wolves are known for the characteristic reddish color of their fur most apparent behind the ears and along the neck and legs, but are mostly brown and buff colored with some black along their backs. Intermediate in size to gray wolves and coyotes, the average adult red wolf weighs 45-80 pounds, stands about 26 inches at the shoulder and is about 4 feet long from the tip of the nose to the end of the tail. Red wolves are social animals that live in packs consisting of a breeding adult pair and their offspring of different years, typically five to eight animals. Red wolves prey on a variety of wild mammals such as raccoon, rabbit, white-tailed deer, nutria, and other rodents. Most active at dusk and dawn, red wolves are elusive and generally avoid humans and human activity. The red wolf is one of the world’s most endangered wild canids. Once common throughout the southeastern United States, red wolf populations were decimated by the 1960s due to intensive predator control programs and loss of habitat. A remnant population of red wolves was found along the Gulf coast of Texas and Louisiana. After being declared an endangered species in 1973, efforts were initiated to locate and capture as many wild red wolves as possible. Of the 17 remaining wolves captured by biologists, 14 became the founders of a successful captive breeding program. Consequently, the United States Fish and Wildlife Service declared red wolves extinct in the wild in 1980. By 1987, enough red wolves were bred in captivity to begin a restoration program on Alligator River National Wildlife Refuge in northeastern North Carolina. Since then, the experimental population area has expanded to include three national wildlife refuges, a Department of Defense bombing range, state-owned lands, and private property, spanning a total of 1.7 million acres. An estimated 24 red wolves roam the wilds of northeastern North Carolina and about 200 comprise the captive breeding program, still an essential element of red wolf recovery. Interbreeding with the coyote (an exotic species not native to North Carolina) has been recognized as the most significant and detrimental threat affecting recovery of red wolves in their native habitat. Currently, adaptive management efforts are making good progress in reducing the threat of coyotes while building the wild red wolf population in northeastern North Carolina. 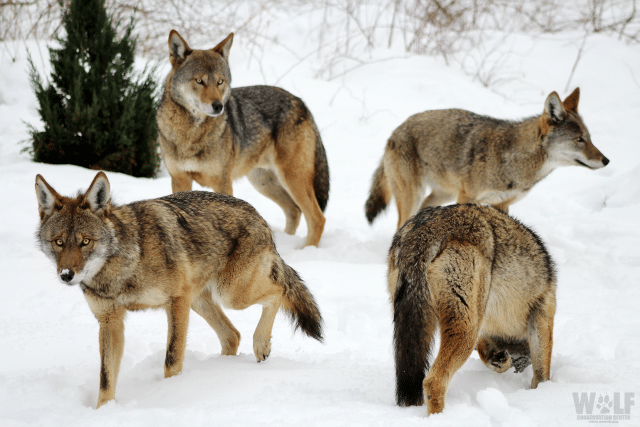 Yet it was the belief that the red wolf caused widespread cattle losses that led to extensive predator control programs in the early part of the 20th Century. Fear and a misunderstanding of the animal led to indiscriminate killing for bounties. The red wolf was also affected by land clearing and drainage projects, logging, mineral exploration, and road development that encroached on its forest habitat. The U.S. Fish and Wildlife Service established a captive-breeding program for the red wolf in 1973. Biologists began to remove remaining red wolves from the wild in an effort to save the species from extinction. These animals were taken to the Point Defiance Zoo and Aquarium in Tacoma, Washington. Over a period of 6 years, more than 400 wolf-like canids were captured in Louisiana and Texas, but of this number, only 43 were considered red wolves and were placed in captivity. Further, breeding experiments revealed that only 17 of the 43 were true red wolves, and only 14 of these successfully bred in captivity. By 1980, the red wolf was considered extinct in the wild. In 1987, four pairs of red wolves were reintroduced to the wild on the 120,000-acre Alligator River National Wildlife Refuge in northeastern North Carolina. Each wolf was equipped with a radio transmitter so that biologists could monitor their movements. Additional releases were made, and the first wild reproduction occurred in 1988. The reintroduction area has beenexpanded to include additional federal and private lands, and now encompasses approximating 500,000 acres. While the wild population was estimated to be about 100 in the start of 2014, the current population estimate is at its lowest level (50 – 75) since the late 1990s. Early releases of red wolves at Alligator River resulted in high mortality, and some animals exhibited a tolerance of people considered to put them at risk because of potential conflict with human activities. Therefore, several island projects were established to serve as pre-reintroduction sites where the wolves could have their first experience in the wild with limited human contact. Wolves placed on these islands have reproduced, and the packs roam freely on the islands. The adults and/or young are subsequently captured and used in reintroduction projects such as the one at the Alligator River refuge, Bulls Island in the Cape Romain National Wildlife Refuge in South Carolina, Horn Island in the Gulf Islands National Seashore in Mississippi, and St. Vincent National Wildlife Refuge in Florida are the three island sites now used as pre-reintroduction sites. Disease and parasites have also caused mortality among the reintroduced red wolf populations. Hookworm, heartworm, distemper, parvovirus and others have taken their toll. Now, released and captive animals are vaccinated against such maladies. A second, experimental reintroduction site was selected in the Great Smoky Mountains National Park to explore the feasibility of the red wolf's re-establishment into the Southern Appalachian Mountains. The objectives of the experiment were to evaluate the red wolf interaction with coyotes, livestock, and people. A 1-year experimental release of a family group in 1991 was successful and concluded by recapturing the animals. A full-scale reintroduction then began with the release of two family groups in 1992. Movement of members of one group outside the park and cattle depredation by the second group required temporary removal of these animals in 1994. The cattle depredations were largely a result of inadequate cattle husbandry practices and damage to fencing from flooding. The cattle operation is being evaluated for needed changes and another family group of wolves has been released in an adjacent area. Biologists continue to monitor the two reintroduced populations of red wolves. The Fish and Wildlife Service also is working with the U.S. Forest Service to evaluate National Forest lands in the Southern Appalachians and elsewhere what may be suitable as future reintroduction sites. Red wolves remain among the world’s most endangered species. The International Union for Conservation of Nature as “Critically Endangered”. Although the red wolf recovery program once served as a model for successful recovery of wolves, political barriers and consistent mismanagement by the USFWS have seriously threatened the continued existence of this highly imperiled species. In 2014, the USFWS stopped reintroducing captive-born red wolves into the wild, ceased implementing the Red Wolf Adaptive Management Plan that limited hybridization with coyotes, and even began issuing kill permits to landowners. In its most recent proposal announced in 2016, the agency called to place most of the last remaining wild red wolves in captivity. Red wolves are highly endangered, but we still time to save them. The Service’s departure from its own accepted and proven management practices has resulted in the corresponding decline in the population. What USFWS, the very agency charged with protecting endangered species, needs to do is restore the field program to the same level of intensity prior to 2014 that achieved success in bringing about a functioning wolf population that once numbered over 130 animals. September 2014 - The U.S. Fish and Wildlife Service (USFWS) announced that it would be conducting a review of the red wolf (Canis rufus) recovery program in eastern North Carolina, per request of the North Carolina Wildlife Resources Commission (NCWRC). According to an August 29, 2014 press release from the USFWS, this review would help determine the fate of the red wolf recovery program. The evaluation was slated to be peer-reviewed and then used to help the Service determine if it should continue, modify, or terminate the program that manages the last remaining wild red wolves on our planet. In November 2014 the Wildlife Management Institute has released its report, A Comprehensive Review and Evaluation of the Red Wolf (Canis rufus) Recovery Program. This report examines the history and current status of the red wolf recovery program in northeastern North Carolina. It calls for extensive changes to rescue the federal government’s struggling, unpopular Red Wolf Recovery Program in five Eastern North Carolina counties. In summary, it says the red wolf effort in North Carolina should expand to other states, as well. On January 29, 2015 the NCWRC approved two resolutions (here and here) aimed at abolishing the red wolf recovery program in North Carolina, home to the only wild population of red wolves in the world. On June 30th, 2015 the USFWS announced that it will suspend reintroductions of red wolf into the wild while it gathers additional science and research into the feasibility of recovery for the species under the Endangered Species Act (ESA). On October 27, 2015, USFWS announced that it would be adjusting its timeframe to complete the review with completion by late summer 2016. The Service announced that it would reconvene a multi-faceted red wolf recovery team to address current and future needs to restore red wolves in the wild.The red wolf recovery team members were selected based on professional expertise or experience in one or more of the four components of the review and for the next steps in planning and implementation. In March 2016, a poll finds that 73 percent of voters support recovering the wolf. On May 24, 2016, Wolf Conservation Center, Animal Welfare Institute, Center for Biological Diversity, Endangered Species Coalition, South Florida Wildlands Association, Wildearth Guardians, and Wildlands Network file Emergency Petition to Revise Red Wolf's 10(j) Rule. June 10, 2016, Population Viability Analysis –FINAL REPORT FOR U.S. FISH AND WILDLIFE SERVICE (USFWS)FEASIBILITY STUDYcompleted..
On June 21, 2016, Red Wolf Coalition, Defenders of Wildlife, and the Animal Welfare Institute filed preliminary injunction to stop USFWS from capturing and killing wild red wolves. On September 12, 2016, USFWS Publishes Its Recommended Decisions in Response to Red wolf Recovery Program Evaluation. The agency's new rule proposes to significantly change the size, scope, and management of the current red wolf recovery program. Read the Wolf Conservation Center's summary. On September 29, 2016, Judge Terrence Boyle issues preliminary injunction to stop USFWS from capturing and killing wild red wolves. On October 11, 2016, The team of scientists who drafted the Population Viability Analysis (PVA) for the red wolf state in a letter that U. S. Fish Wildlife Service’s (USFWS) decision to pull almost all of the last remaining wild red wolves and place them in captivity was based on “many alarming misinterpretations” of their scientific analysis. More. On November 30, 2016, In a letter, dozens of scientists with expertise in ecology, genetics and other areas relevant to wolf conservation have urged the U.S. Fish and Wildlife Service to promote, not curtail, red wolf recovery. More. On December 07, 2016, Ranking Member Raúl M. Grijalva (D-Ariz.) and eight other key Democratic Members of Congress sent a letter to Interior Secretary Sally Jewell calling on her to override the U.S. Fish and Wildlife Service’s (FWS) recent decision to eliminate its recovery program for red wolves. The letter points out that the decision was made despite scientific consensus that red wolf recovery can succeed if the agency continues and amplifies its existing efforts. More. On December 8, 2016, Wolf Conservation Center, Animal Welfare Institute, Center for Biological Diversity, Endangered Species Coalition, South Florida Wildlands Association, Wildearth Guardians, and Wildlands Network file a petition with the federal agency seeking an updated recovery plan for critically endangered species. On January 19, 2017, In a letter, USFWS Southeast Regional Director Cynthia Dohner pledged to prepare an updated recovery plan in 2018 for the rapidly dwindling population of wild red wolves. The Service explained that a revised recovery plan will incorporate new information about red wolves, including a “species status assessment” to be prepared by October. On May 23, 2017, USFWS publishes its proposed rule, Endangered and Threatened Wildlife and Plants; Nonessential Experimental Population of Red Wolves (Canis rufus) in North Carolina, to revise the existing nonessential experimental population designation of red wolves in North Carolina under section 10(j) of the Endangered Species Act to allow significant changes in the size, scope, and management of the current red wolf recovery program. The 60 day comment period closed July 24, 2017. On April 24, 2018, USFWS releases its Species Status Assessment (SSA) and five-year review for the critically endangered red wolf. On June 28, 2018, USFWS release its notice of intent to propose to replace the existing regulations governing the nonessential experimental population designation of the red wolf (Canis rufus) under section 10(j) of the Endangered Species Act, as published in the Federal Register (Docket No. FWS-R4-ES-2018-0035). USFWS invited the public to comment via the federal register over a 30-day period ending July 30, 2018. Find talking points and additional resources here. July 31, 2018, In a letter sent to the USFWS, North Carolina Gov. Roy Cooper urged the agency to recommit to red wolf recovery by maintaining the current five-county conservation area for the endangered species. Red wolves remain among the world’s most endangered species. The current estimate puts the only wild population of red wolves at their lowest level (30-35) since the late 1990s. What is the Red Wolf Species Survival Plan (RWSSP)? A Species Survival Plan (SSP) is a breeding and management program designed to ensure the long-term sustainability of captive-based animal populations. It’s a coordinated effort among zoos, organizations like the Wolf Conservation Center, U.S. Fish and Wildlife Service, and managed under the Association of Zoos and Aquariums (AZA). View Red Wolf Species Survival Plan Population Analysis and Breeding and Transfer Recommendations. The Red Wolf SSP meets annually to develop recommendations that guide breeding and transfer objectives for the living population. These recommendations are are posted on the RWSSP website. A studbook is a pedigree that identifies a red wolf with its own unique “studbook number” and follows that animal throughout all events in its lifetime. The studbook is an important tool that is used when making breeding and transfer recommendations. The U.S. Fish & Wildlife Service provides additional recovery program documents as downloadable pdf files on its website here. 2012 "Song of the South" via UK Wolf Conservation Trust Magazine. 2010 "Return to the Wild" via UK Wolf Conservation Trust Magazine. 2018 ECOLOGY, MANAGEMENT, AND RECOVERY OF RED WOLVES IN EASTERN NORTH CAROLINA, Joseph Hinton, Ph.D.
2018 The Red Wolf: Disease, Genetics, and the Future, with Kristin Brzeski, PhD.